Paint your nails in bright orange and cream color combination. The design features a plain orange and cream base color. Small white flowers and orange butterfly details are added on top. Painting pretty butterfly nail art designs! Butterfly nails are very pretty to look at. They can vary in design and colors and you can have fun painting them on your nails. You can paint on a single butterfly or two per nail depending on the nail design that you are going for. However you might look at it as a design that is difficult to copy or reproduce on your own, fret not, because you can make your own butterfly nail art design! How will you do this? It’s just simple! Prepare your nail art tools and pull up a lovely butterfly nail reference. 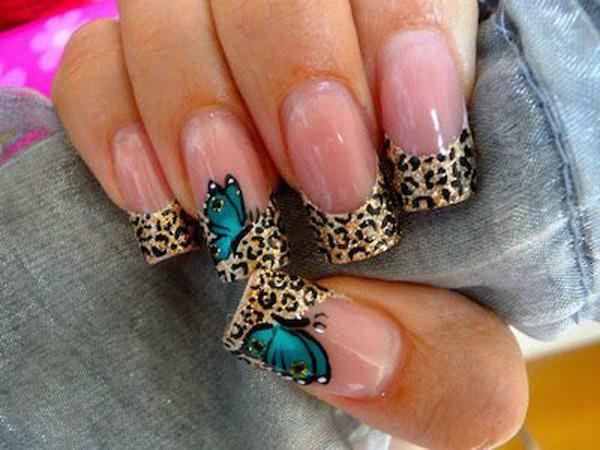 You can easily search the internet for designs of butterfly nails that tickle your fancy. There are even blogs dedicated to tutorials on how you can paint the designs on your own. You may start with a simple design, but if you’re feeling artistic and creative, you can jump to the design of your choice and try it on. Remember that it would take some time and practice for you to get some of the designs. All it takes is patience and dedication to achieve the design on your own. This is perfect especially when you don’t want to go out to nail salons and would rather save your cash to painting your own nails. If you’re up for it and you feel that you can do a good job on the butterfly nail design then don’t hesitate. 5. Then proceed to add details on the wings, you can outline the wings with another polish and add small dots on top of the inner wings as well. It’s simple and easy. You might want to begin with a simple butterfly design or follow a reference if you have trouble in creating your own butterfly design. You can also gather inspiration from a lot of butterfly designs online. It can also help if you have a friend who knows how to do these designs and can teach you a trick or two. For first timers, painting on the left hand might be tricky enough, how much more on the right hand? This is where your friend comes into the picture and can assist you for starters. Of course every new type of nail art design can have its rocky beginnings, but once you get the hang of it, painting on your nails will be easier the more that you practice on creating them. Always be eager to learn and learn tips and advices from your sources to be able to recreate that perfect butterfly nail art design you have so much wanted to achieve. A beautiful and creative French tip design perfect for your nails. Clear polish is used as based with baby pink polish for the French tip. Slim butterfly details and curves are then added plus silver beads for effect. 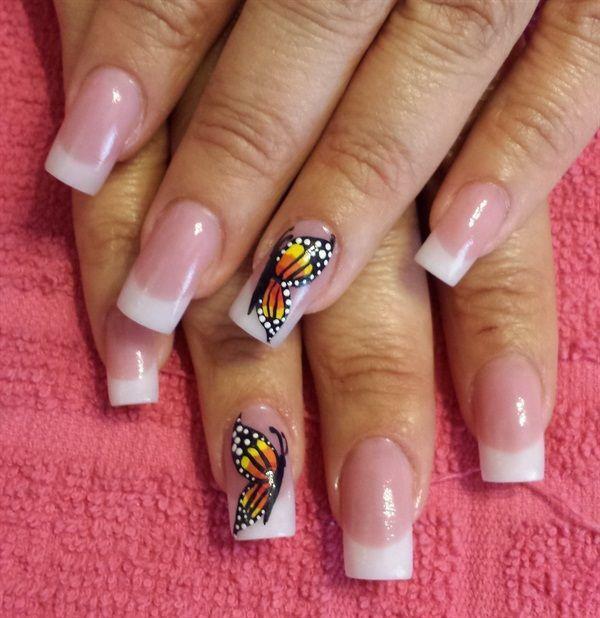 Another simple yet stunning French tip design with butterflies. You have your classic clear polish and white French tip design added with a large butterfly detail on top. A cute butterfly inspired French tip design. Play along with melon and aquamarine colors as you paint flowers and butterflies on top of the regular French tip design. 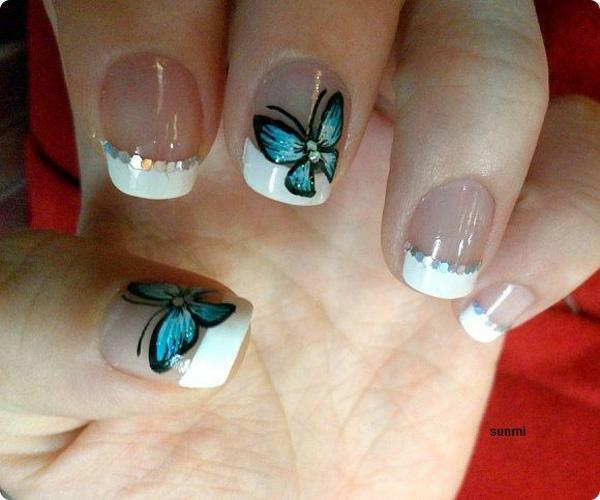 This is a simplistic yet very cute butterfly nail art design. Using a color combination of white, baby pink and black, you can create flower an butterfly details in contrast color to the base polish. You can even add pink and black beads for more effects. Classic looking French tip nails with a butterfly design. The design consists of a simple white French tip with pink polka dots and a red and black butterfly detail painted on top of it. Silver sprinkles are also added as lining for the French tip. Add glamour to your nails with this beautiful butterfly nail art design. Use a classic orange nail polish as base and for the French tip and add small details butterflies in baby blue and pink polish to accentuate the nails more. 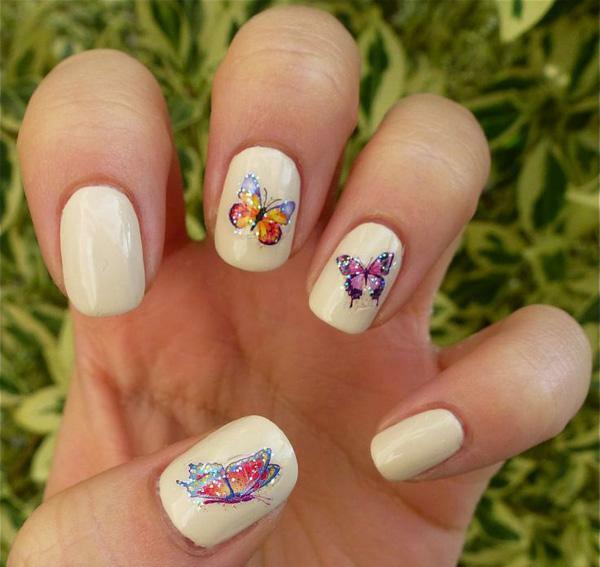 Inspired by butterflies and its wings, this butterfly nail art design is simple gorgeous. Each nail is painted with a part of a butterfly’s wings wherein one single nail is where a whole butterfly is painted in detail. Small black polka dots are also added for ore accent. A beautiful collection of butterfly designs perfect for your butterfly nail art design inspiration. The use of a simple white base color is perfect to give life and focus to the highly details and colorful butterflies painted on top. Various color combinations are used with each butterfly having a theme of its own. This is a perfect butterfly inspired nail art for short nails. A in French tip using midnight blue polish with added white polka dots looks striking in contrast to the plain nails with blue butterfly and black polka dots painted on top. 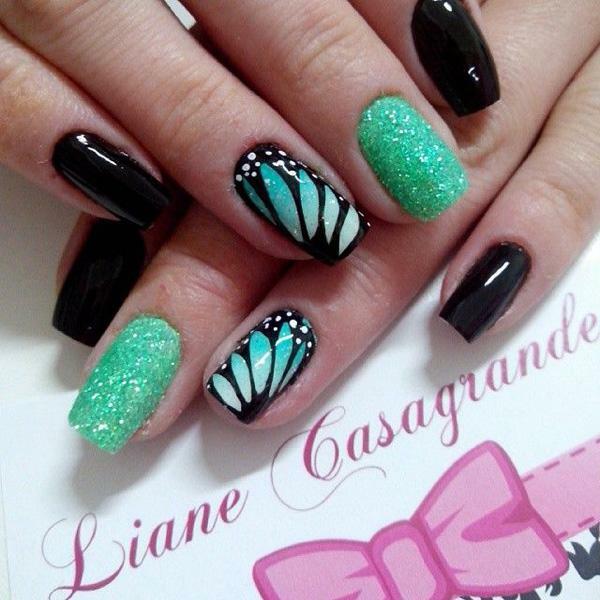 Check out this white and green themed butterfly nail art design. Very simple and easy to create yet it’s very striking and attractive looking. 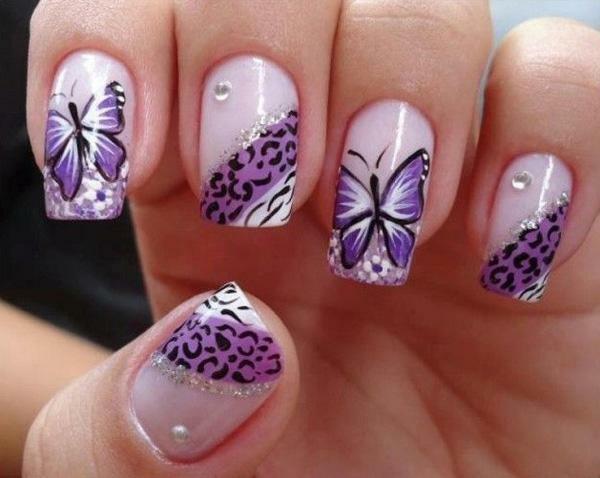 The large detail of the butterfly’s wings contrasts perfectly with the bare matte nails beside them. 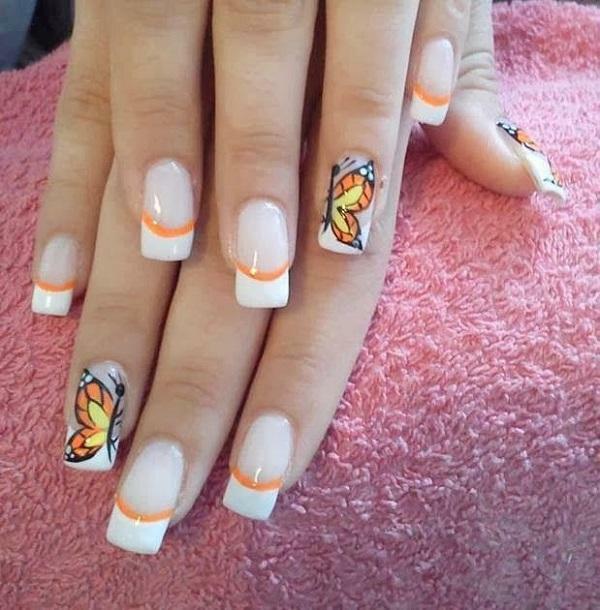 This is a beautiful uniform butterfly inspired nail art. The nails are designed with small French tips in spring green sparkles plus white flower petals adorned on the side. 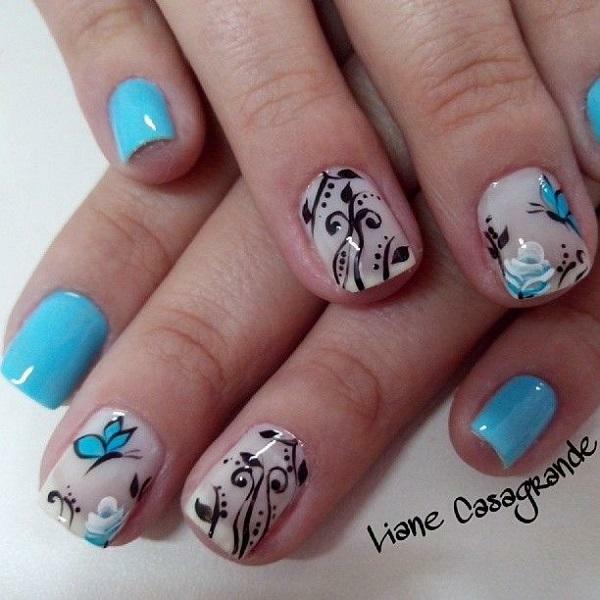 A detailed painting for a blue butterfly can be seen on the other nails hovering over a white flower. Check this amazing looking butterfly nail art design. 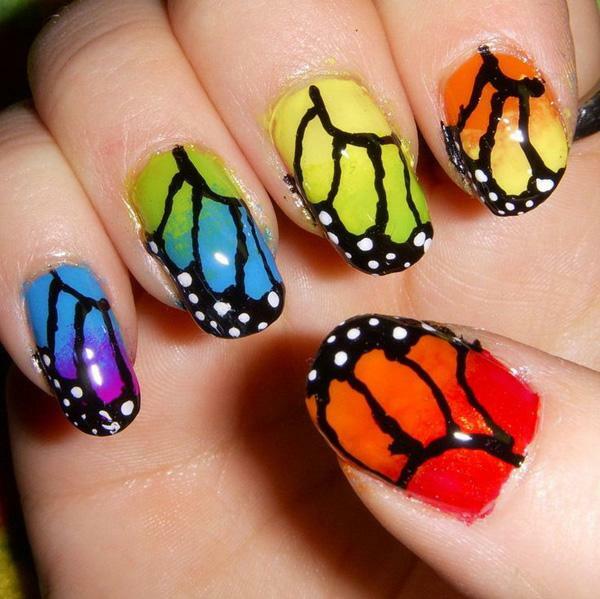 Gradient colors of butterfly wings are painted on each of the nails. 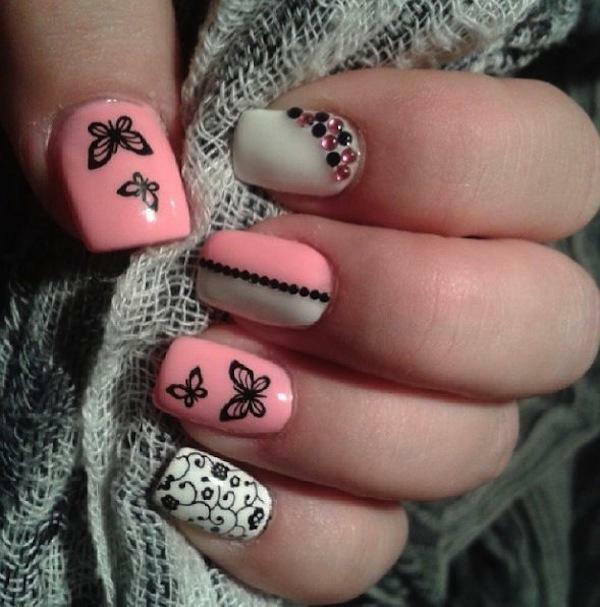 The thin black lines of the butterfly wings also work as a polka dot French tip which is just so creative. Take a look at this very cool and elegant looking butterfly nail art design. The color combination of black, white and sea green simply complement each other. The matte sea green sparkles stand out along with the detailed painting of a butterfly’s wings on the other nails. 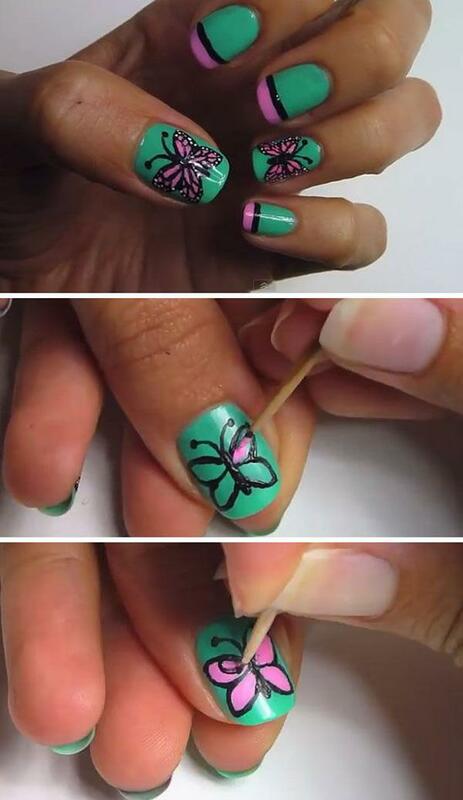 This butterfly nail art design looks very fun to work with. 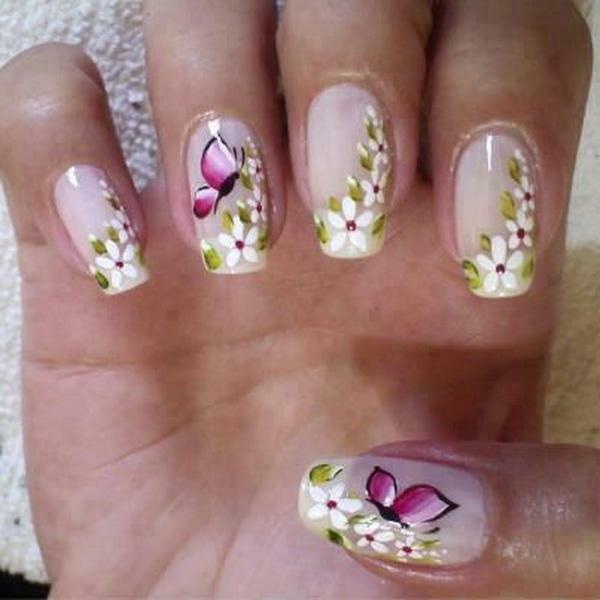 The design is simply painted with a matte white base color along with colorful flowers on them, thin curves of green and fluttering butterflies all over the nails. 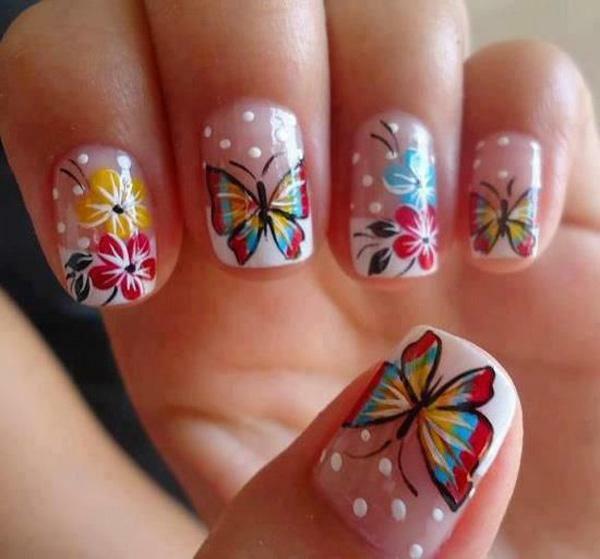 Butterfly nail art designs are the way to go when you want cool looking nails. 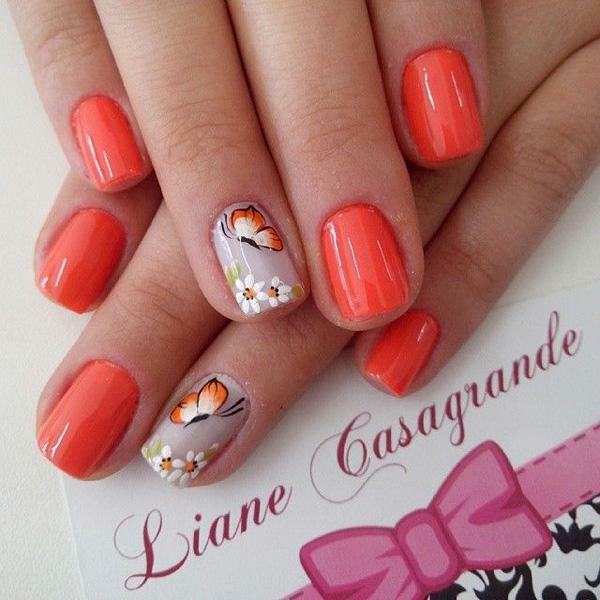 This design features a white French tip and polka dot design, added with colorful flowers with butterflies on top of them. The butterflies are created with a combination of red, blue, yellow, green and black colors. 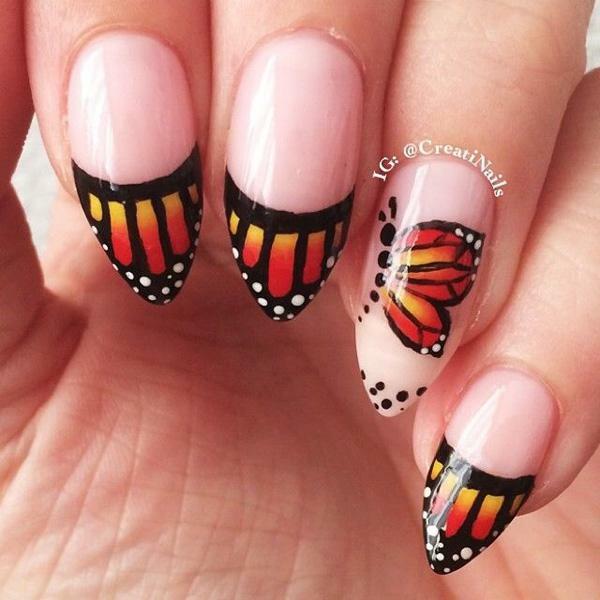 Another amazing looking butterfly nail art design! The midnight blue French tips are added with white polka dots while the nails are further adorned with white flowers. Red butterflies can be seen flying all around the flowers. This design is a beautiful and simply elegant butterfly themed design. 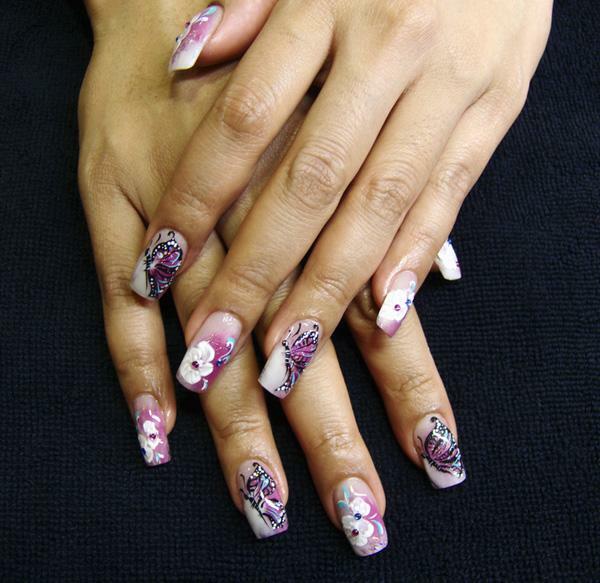 The white flowers are painted as cascading over the side of the nails while a magenta colored butterfly hovers atop of them. Another great design for short nails. The design starts out with a white French tip which is further bordered with multicolored beads for effect. A huge blue butterfly is them painted in strict detail as if to enthrall the attention of anyone who looks at the nails. 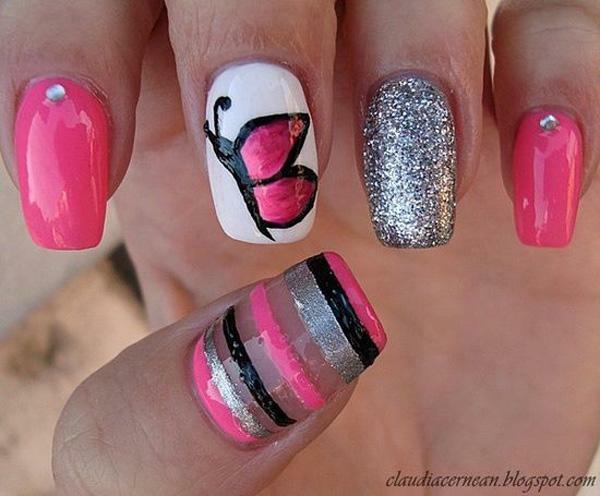 This butterfly nail art design looks preppy and minimalistic. Perfect for those who want simple yet eye catching butterfly nail art designs. The nails are painted in matte white color as base. Parts and pieces of a butterfly’s wings are then painted in close up detail. Try out wild and exotic looking butterfly themed nail art! This design sports a leopard print French tip topped with a green blue colored butterfly. Show off the animalistic side of you. 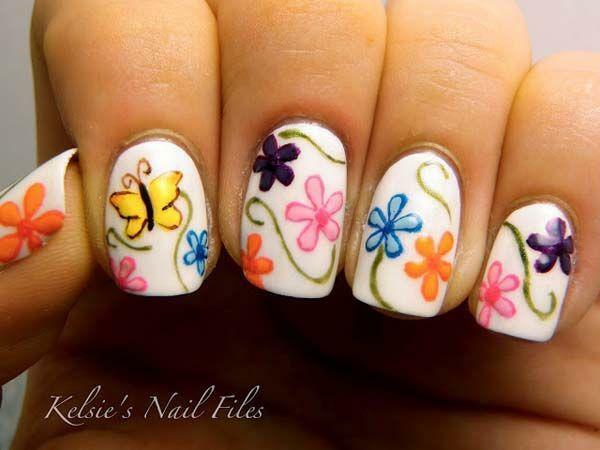 Take a look at this really cute and simple butterfly nail art design. The nails are coated with lime green polish as base color, topped with flowers in white and yellow combination. 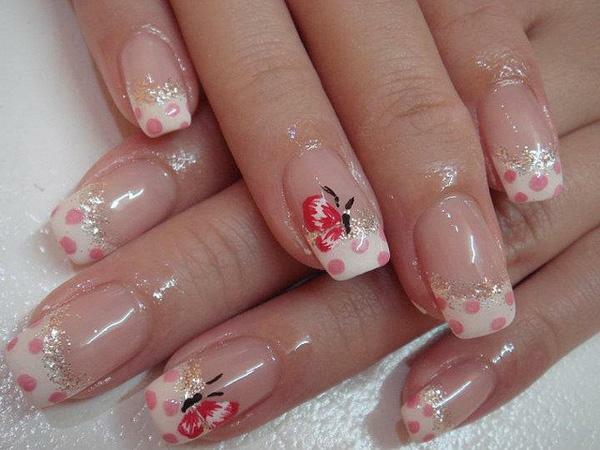 A cute and red butterfly is also added flying through the nails. Beautiful butterflies nail art design in Periwinkle hue. Using a lighter shade of Periwinkle as base color, the nails also sport a leopard print French tip lined with silver sparkles and black and white curved lines. A moderate Periwinkle color is then used for the butterflies and black polish for the details. 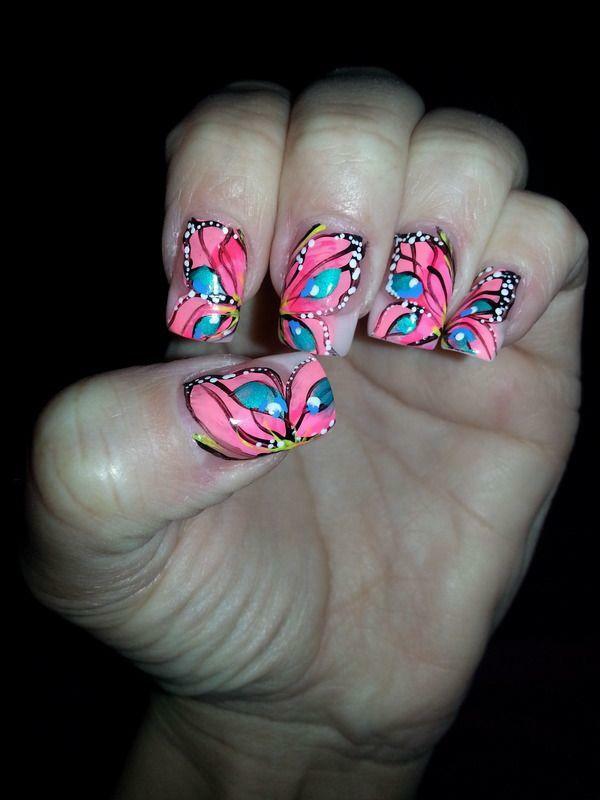 This butterfly nail art design is quite eye catching and vibrant. With a combination of white, hot pink, black and silver polish, the nails are given attitude and life! Matte white and hot pink coats are used as well as silver sparkles adorning one of the nails. 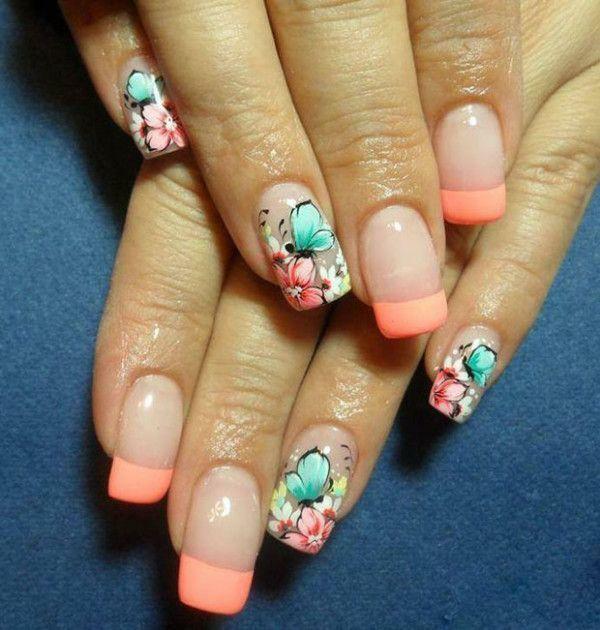 Bold, horizontal lines in alternating colors are also painted on the nails as well as a flying pink butterfly. 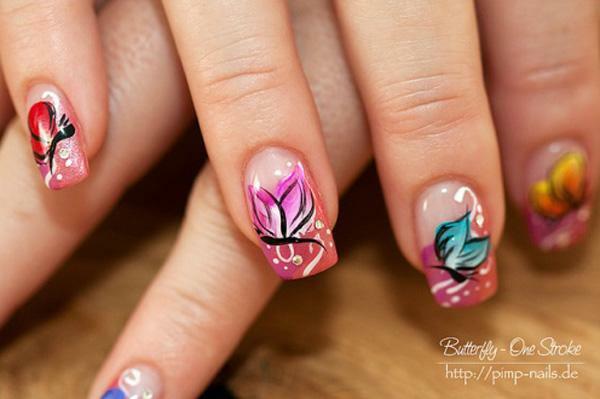 If you want detail after detail in a butterfly nail art design, then this is perfect for you. paint your nails in close of butterfly wings with an array of details in vibrant colors. Ach nail represents a half of a butterfly’s wings and the colors used as pink, blue green, yellow, white for the dots and black for the lining. 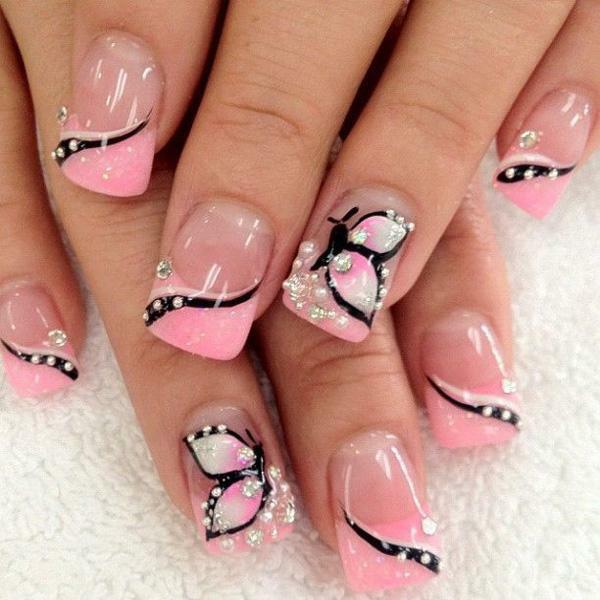 Above is an elegant looking butterfly nail art design. 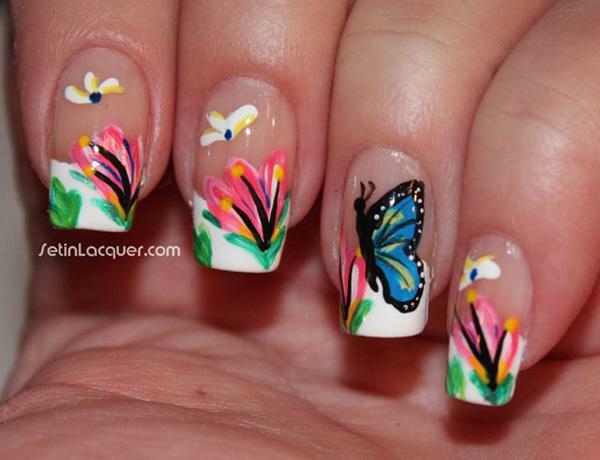 The butterflies and flowers are painted as elongated French tips on the nails. Violet, black and white polish are used to create miniature details on the flowers and butterflies. 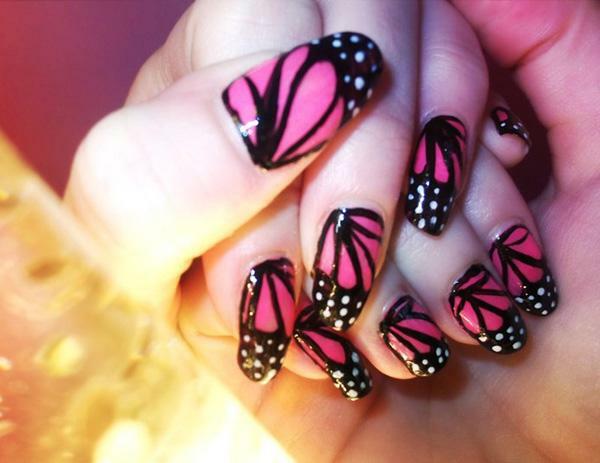 If you are going for the simplistic approach on butterfly nail art designs, then you might want to consider this one. Using black as base color and lining of the butterfly wings, additional details such as various shapes are added on top, mimicking a butterfly wing’s design. 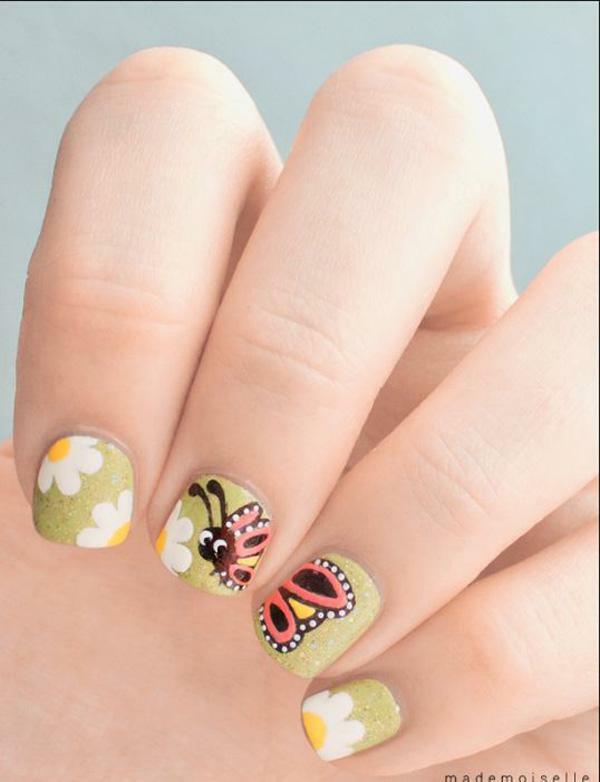 This butterfly inspired nail art is simply cute and easy to recreate. The uniform design makes it easier for you to follow on your own nails. 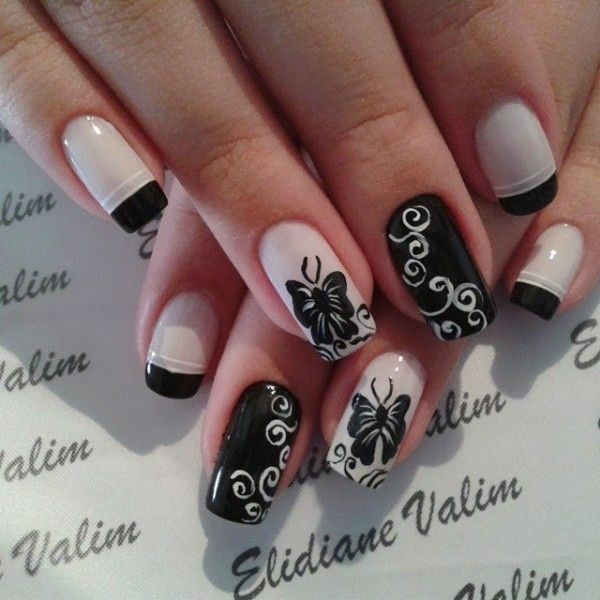 All you need is black and white nail polish and paint the butterflies as a French tip, using white as your background polish and black as the lining on top to detail the butterfly. 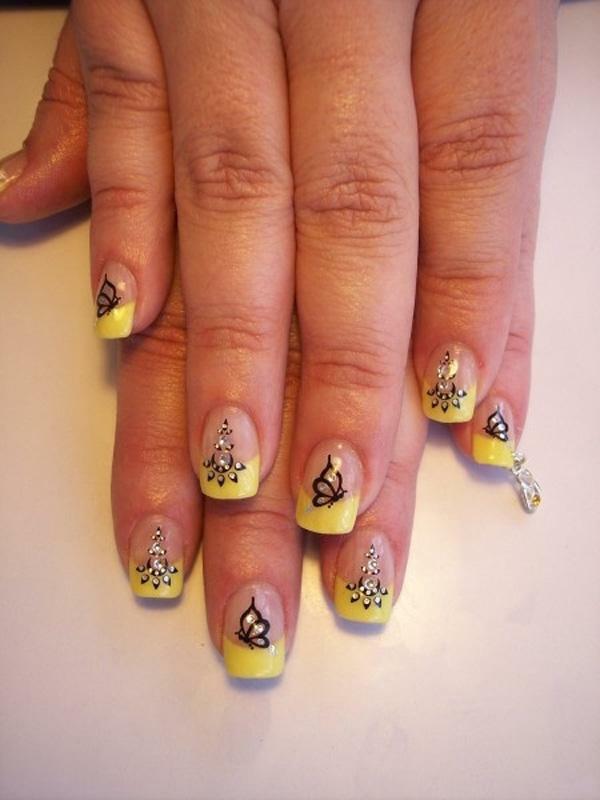 Butterflies nail art design in yellow theme. The nails are painted with yellow French tips followed by butterfly and other details on top using a black polish. The nails are further accented with silver beads. If you’re looking for fun and quirky, this butterfly nail art design will surely fit your taste. Using alternating polishes of black and white, the nails are painted over with French tips and curves opposite to the base color. 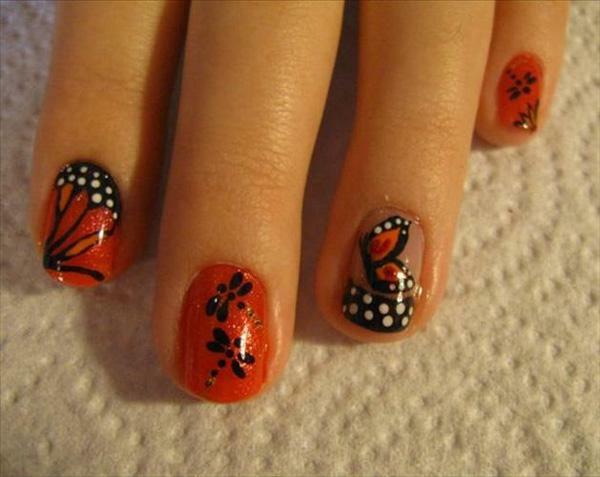 Silhouettes of butterflies are also added on top of the nails. Who says short nails can’t have as much fun as longer nails? Surely not this design! The black and white polish is used to create the butterflies’ details and polka dots while the red polish serves as the base color and the shade of the wings itself. More shapes and curves as also added for effect. A very cute and flashy butterfly inspired nail art design. Coated in carnation pink as the base and wing colors, black polish is used to paint out the wing details. The white polish is then added to create small dots across the wings. 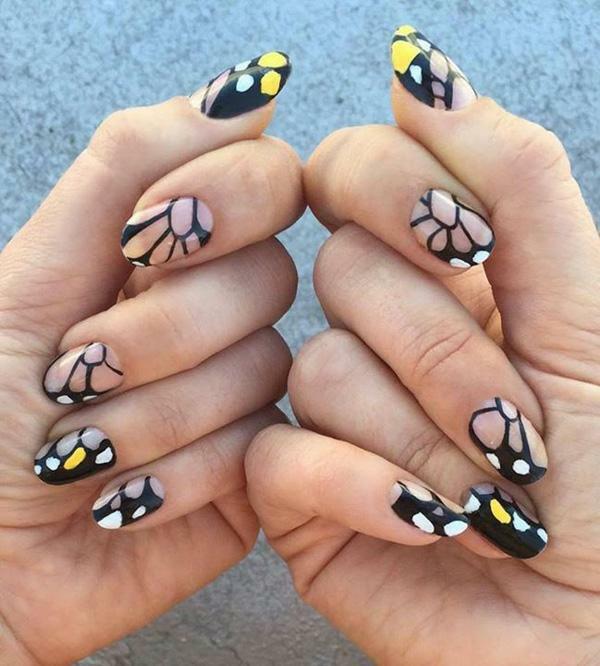 This nail art design sports a different type of butterfly for each nail. 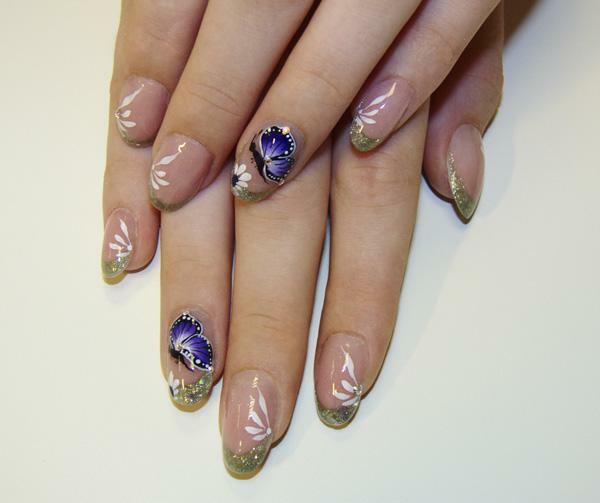 The nail art looks very abstract and pleasant to the eyes as it uses gradient colors for the base and butterfly colors. Black and white polish is then used to paint out the additional details on the butterflies. If you would like to recreate your own butterfly nails then this would be the perfect reference. 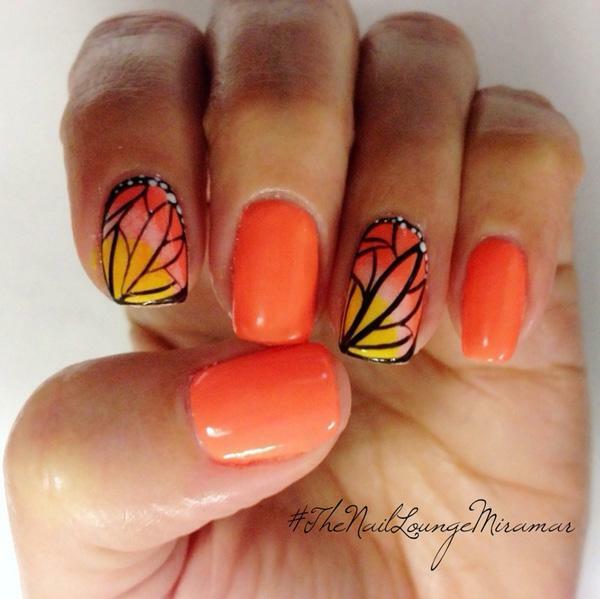 All you would need to do is to use orange as your base color and paint out the butterfly wing details using the black nail polish. For more effect you can add white spots on the edges to make it look like different wing sides. Metallic blue themed butterfly nail art design. The nails are French tipped with metallic blue polish and white polka dots. The other nails are painted in matte white for base color and black polka dots. Majestic blue butterflies in glorious detail are then painted on top and accentuated with blue beads. 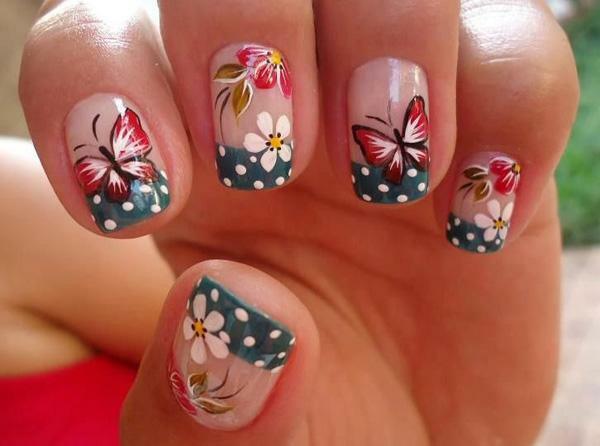 A wonderful looking butterfly inspired nail art depicting butterflies hovering atop flowers in the field. White polish with pink flowers are painted in French tip style while the butterflies in white and blue polish are painted flying on top of them. Amazing looking polka dot French tips and butterfly nail art design. The ails use a white polish as base with midnight blue and white polka dot French tips. 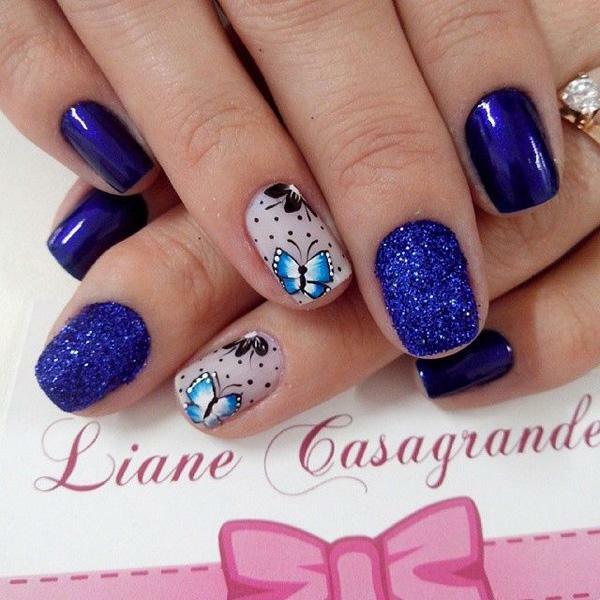 A blue butterfly is then painted over the nails with black polka dots all around. Green and pink themed butterflies nail art design. The nails are painted with green as the base color and tipped with pink polish. Additional black lines are added for the French tips. A wonderful pink butterfly is then painted in top with black and white details. 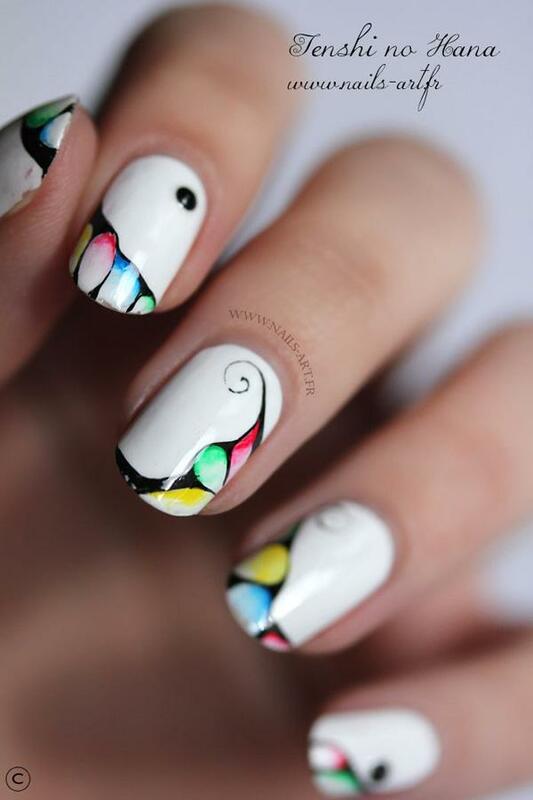 A cool looking butterfly inspired nail art design. The nails are painted with royal blue and blue gray polish as base colors. 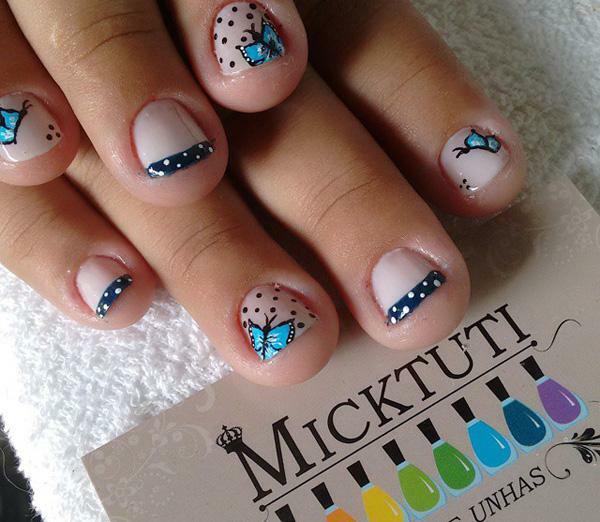 Atop the blue gray nails rests pretty butterflies in light blue polish with black polka dots surrounding them. The nails are also painted in royal blue sparkles for effect.